The Xdream is a commercial grade fully interactive Mountain Bike simulator that accurately brings the outdoors indoors. The X-Dream is the first fitness product to successfully integrate accurate real-life simulation, total body cardiovascular conditioning and a motivational personalized training program. Real feel gears, brakes, handlebars, pedals, cranks and seat sensors enable each move the rider makes to be accurately portrayed within the experience. The X-Dream’s resistance accurately depicts the terrain gradients, track surfaces and conditions. The advanced software programming uses challenge and reward motivation within an expert personal training system. Get ready to be challenged by the realistic virtual trail rides, your artificial intelligence competitors or race against your own ghost rides for the ultimate benchmark. You will be rewarded with new trails, features and levels. Motivation through justified Reward is what the X-Dream is all about. You will ride through Parkland trails, climb up Highland ascents, dodge rocks in Semi-Arid or ride over sand dunes in the Desert. The design of the X-Dream is based on a real mountain bike to give you smooth resistance, real-world riding feel and a high degree of bike adjustment – making it ideal for everyone, not matter what your size or current fitness level, giving you a total body workout. 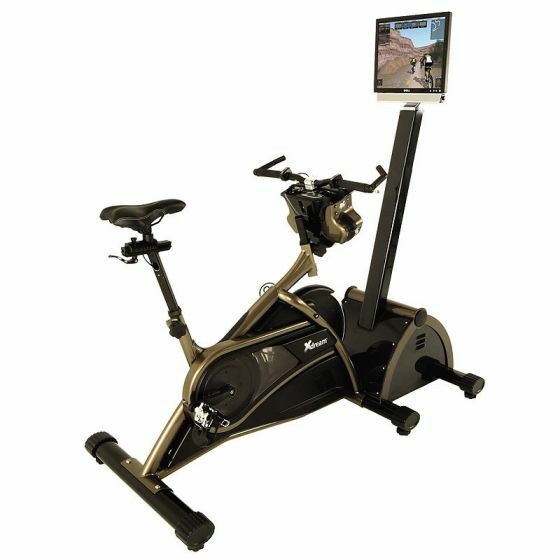 Commercial Grade Virtual Reality Exercise Cycle with micro adjustable rider compartment. 4 worlds 400 challenges 20 unique courses 80 fitness levels. Feedback includes Watts Cadence Calories Speed Time and Distance. Total Body, Low Impact cycle training with Core and Lower Back strengthening. Quiet belt drive system Comfort Saddle seat fore and after adjustment ISIS grade steel cranks and dual sided SPD pedals. Buy Trixter Xdream Exercise Bike (Original) online. If you are interested in the Trixter Xdream Exercise Bike (Original) for sale, feel free to enquire above.